Deserving Dogs Win Cruise Aboard Nauti-Dog II. 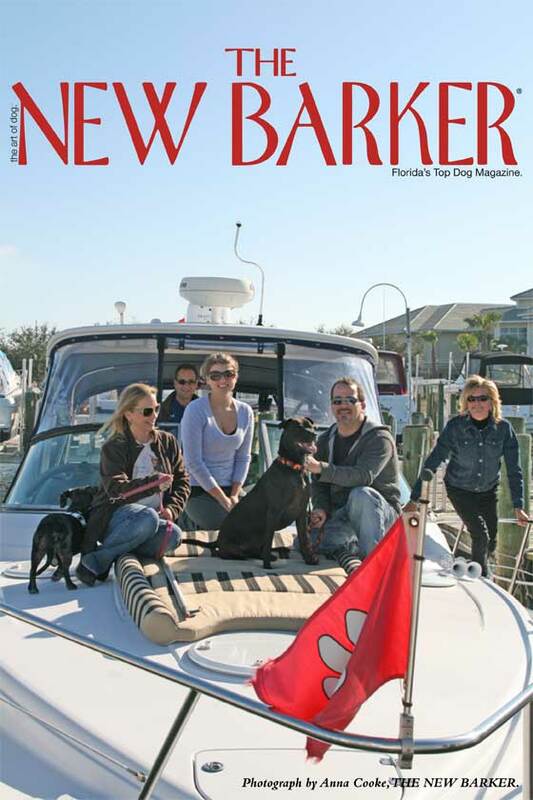 With a little help from The New Barker dog magazine, two Jacksonville, Florida dogs win a cruise aboard the Nauti-Dog II yacht in St. Petersburg, Florida. Written by Kelly Herson for The New Barker. 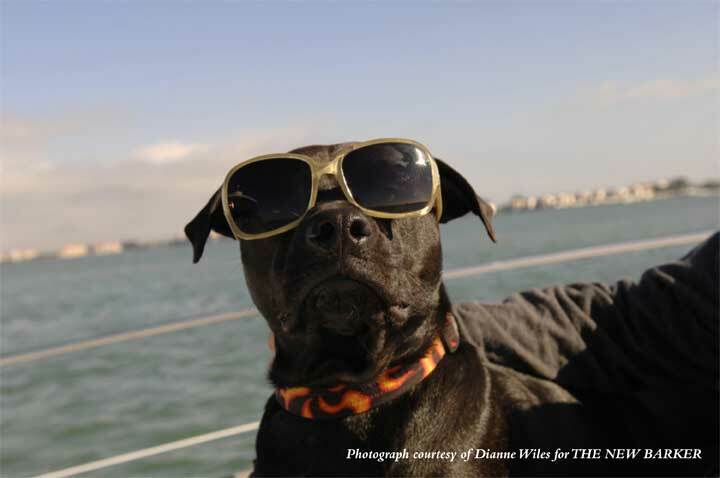 The New Barker dog magazine & Nauti-Dog Yacht Charters arrange a very special cruise. You wouldn’t know Phoenix and Lily hadn’t been raised in the lap of luxury from the way they took to yachting. Sitting on the foredeck as the prow of the Nauti-Dog II cut through the calm waters off St. Petersburg’s coast, the two dogs sunned themselves and enjoyed the occasional mist of salt water. Phoenix and Lily, along with their human parents Dianne Wiles and Nooney Ritacco, were guests courtesy of Nauti-Dog II owners Anne and Tony Baker. The Bakers, who ran the Nauti-Dog Cruise Contest in conjunction with THE NEW BARKER dog magazine, asked entrants to submit a short essay explaining why they should win the prize—a cruise in the temperate Gulf with their canine companions. While all of the entries were compelling, Dianne’s entry detailing Phoenix and Lily’s rocky beginnings stood out amongst the 40-plus entries as being the most deserving. Watching Phoenix and Lily enjoy the warm December day out on the Gulf, it is unthinkable that these beautiful, fun-loving dogs were once as far from the lap of luxury as one could get—the gutter. This is Phoenix, before his adoption by Dianne and Nooney. Dianne and Nooney, from Jacksonville, Florida, know all too well the hard-luck beginnings their two dogs survived. Phoenix, a two year-old Black Lab/Bulldog mix, was dubbed “Gutter Dog” by the Department of Animal Control after he was found in a ditch on a hot August day, perilously close to dehydration in the sweltering 100-degree heat. Phoenix looked like “one big scab,” and had ripped out his dewclaw trying to escape. 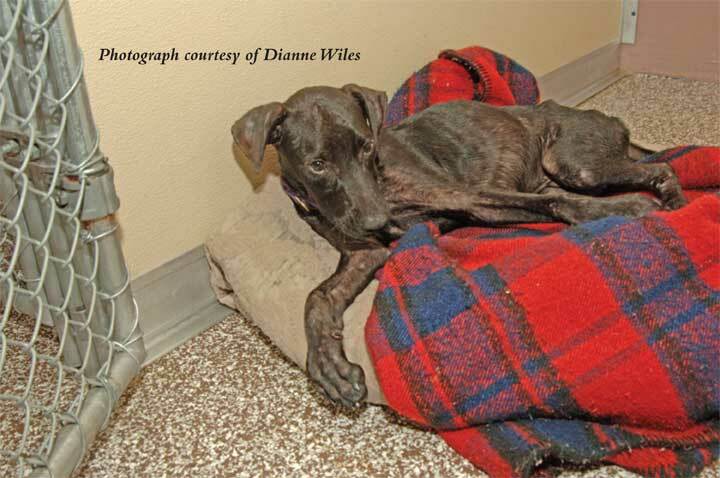 Dianne found him lying half-dead in a kennel next to the euthanasia room, but like his namesake, Phoenix seemed to rise from the ashes even as death lingered a hairsbreadth away. As Dianne drew nearer, Phoenix started wagging his tail, slapping it against the stainless steel cage. A volunteer photographer of adoptable dogs with First Coast No More Homeless Pets, Dianne was accustomed to working around animals, and was no stranger to the harsh realities of shelter life. Yet she could not hold back tears once she met the emaciated Phoenix and learned about the hardships he’d endured, including eating sticks and leaves to survive. It would be a year before his weight reached a normal level and all his fur grew back. Lily as a puppy, just prior to her adoption by Dianne and Nooney. 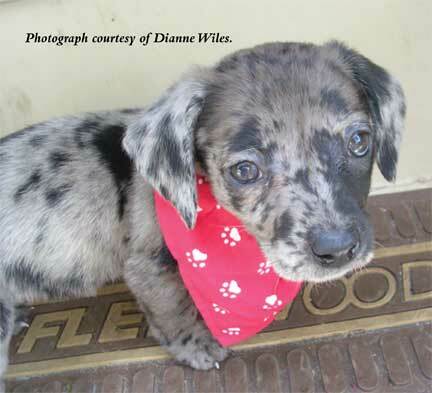 Lily, a four year-old Dachshund/Catahoula Leopard Dog mix, is Phoenix’s beloved older sister and Dianne and Nooney’s “first child.” Like Phoenix, Lily’s name signifies her rebirth. She was adopted on Easter, and was thus named for the Easter lily. When Dianne found Lily through an online ad, she discovered that a rescue group had pulled a pregnant Lily from the pound. Since they could not deliver puppies at the pound, Lily and her unborn pups were going to be euthanized. After giving birth, Lily found herself without a home. It was a happy coincidence that Dianne and Nooney were looking to expand their own family around the same time. Phoenix today. He is one cool dude cruising on the Nauti-Dog II. Lily today. She is shown here singing on deck of the Nauti-Dog II. As the Nauti-Dog II heads back to the marina, a pod of dolphins suddenly appears off the starboard bow. Phoenix and Lily, like the human passengers, quickly move to get a closer look. The dolphins fall back to jump and frolic in the yacht’s wake, as if inviting everyone to come and play. The irrepressible Lily gives a long, warbling howl, and Phoenix wags his tail, a goofy canine grin on his face. Their joy is a powerful reminder of the day’s real luxury—being together to experience it. Dog friendly cruises on the Nauti-Dog II start at $199 for a group of up to six adults and six dogs. Call 727.458.3513. First Coast No More Homeless Pets provides low-cost spay/neuter programs in Jacksonville. Call 904.425.0005. 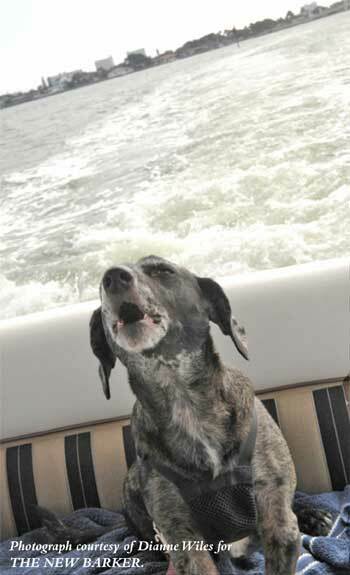 Deserving Dogs Win Cruise on Nauti-Dog II was written by Kelly Herson, rover reporter and photographer for THE NEW BARKER dog magazine, a Florida lifestyle magazine devoted to all things dog. Previous Previous post: Dog Days of Summer to Benefit Cindy’s Pets in Pasco. Next Next post: Xena Helps Rescue A Gulf Island in Florida.